The classic deviled egg recipe using mustard, mayonnaise, pickle relish, and black pepper just got easier thanks to the pressure cooker. Place the eggs in your pressure cooker using this recipe and you will have perfectly hard-boiled eggs every time. The best part is that they are ready in about 20 minutes! These deviled eggs are perfect for Thanksgiving appetizers, dinner parties, potlucks, or just plain snacking. Pour water into the pot of your pressure cooker. Put eggs into the steamer basket; place into the pot. Select Pressure Cook (Manual) and cook for 5 minutes on High pressure. Plunge eggs into an ice bath until cooled completely, about 5 minutes. Peel eggs and halve lengthwise. Remove yolks to a bowl and mash with a fork; add mayonnaise, mustard, and relish and stir. Season mixture with salt and pepper. Spoon yolk mixture into egg white halves. 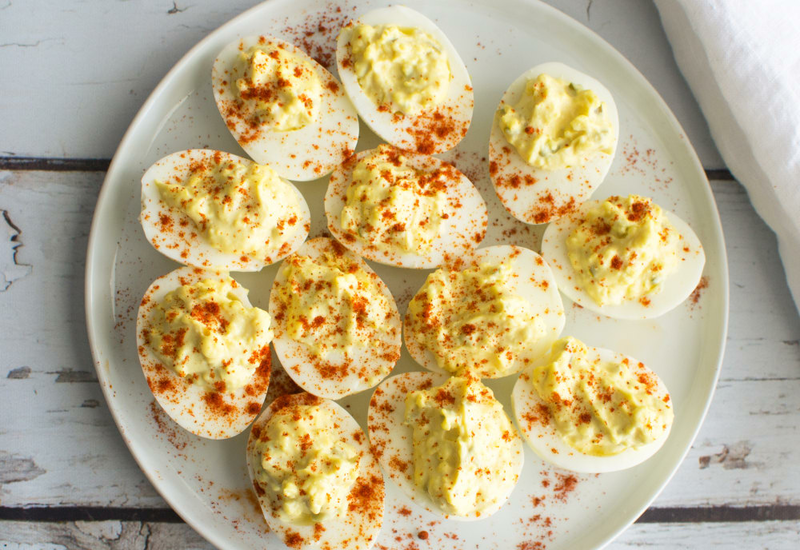 Sprinkle paprika lightly over the deviled eggs. The term "deviled" came to be used most often with spicy or zesty food. Deviled eggs are often prepared with mustard, pepper or other spicy or zesty ingredients stuffed in the yolk cavity. Per Serving: 145 calories; 12g fat; 3.0g carbohydrates; 7g protein; 190mg cholesterol; 312mg sodium. Making Hardboiled Eggs in my Multipot is my very favorite thing. I have always loved deviled eggs but typically have bought them in the past because I thought they were too much work. We have lots of eggs on our farm and we have been making these just about every week since finding this recipe. This would be a great dish for a gameday or party get together. It doesn’t get any easier than this folks. I’ve never had luck making deviled eggs. Peeling was always a hassle and often looked like a mess. This is the perfect process and peeling was simple with the shell coming off in large pieces. The yolk was a beautiful yellow and I also substituted horseradish for the relish for less of that sweet-tasting filling. Delicious! Great base deviled eggs recipe. I added minced jalapeño for an extra kick. These are great for entertaining and they go quick! Also, I used a design tip when I added the filing, so they were extra fancy. Used Old Bay seasoning for these deviled eggs instead of paprika. It’s way faster to make than boiling the eggs in a pot, and better tasting than store bought. Can’t lose! Had to bring a dish for the office potluck and I came across this recipe. I used dijon mustard and chili powder in my recipe and finished them off with a nice topping of bacon bits. Hold the pickle relish and add horseradish instead. Makes a nice change. It was good, although I made it a little bit different But use the same ingredients. Mine were not done. I tried again but cooked 6 eggs 6 minutes and let pressure release naturally 5 minutes before quick release. Perfect!